I am wrapping up this year’s YLF trip on the flight from Xi’an to Shanghai. I said farewell to my dearest friends today, after singing the song of all kinds on friendship last night. From time to time, I assert the necessity of the trip most of the time when I wrap it up. Obviously, these three days are very worth the time. I am a strong believer of vision and inspiration. To be able to be visionary, you have to consistently look beyond what is already in your landscape by listening to people who are out of your knowledge. This cross-country, and cross-industry in-depth event helps me to understand more about something I completely have no idea. My friends are so kind of guide me to their world, and help me to understand. The key of this mentorship is, they are not just someone who is from that field, they are actually one of the best in their field. Ballet – yes, Ballet, from the top ballet dancer Jeremy! The list goes on and on and on. 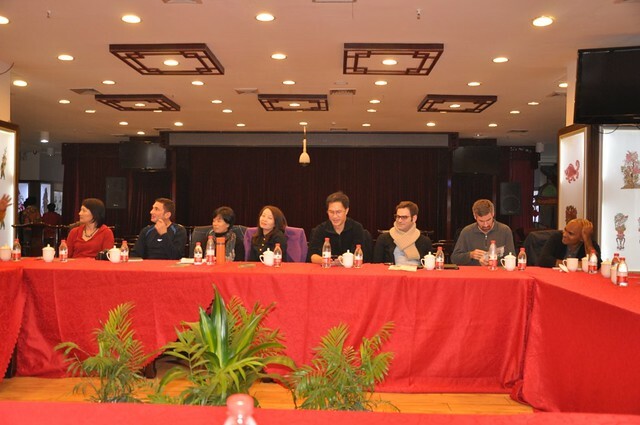 More interestingly, most of the talks happened not in the conference room. They were the side conversation when we were bored on a bus, or walked in the dark night under the splendid stars, or at the mountains in the middle of nowhere. That experience was so unique, and precious. Beside the cross industry learning, the more meaningful thing is sharing of personal experiences. People were selected into the program from 10 years ago when they were under 40. Now, they have been mature enough to experience the key moments in life – ups and downs, and how they handle the criss also gave me great power. (Obviously I will keep strictly confidential about that part, which is so private to each of us). Things like religions, Buddha stories, how to mediate, and to things of how to schedule trips, or just some piece in the history, are talked. Big or small, they were so helpful. I believe there must be a reason for this group of people to archive what they have archived. 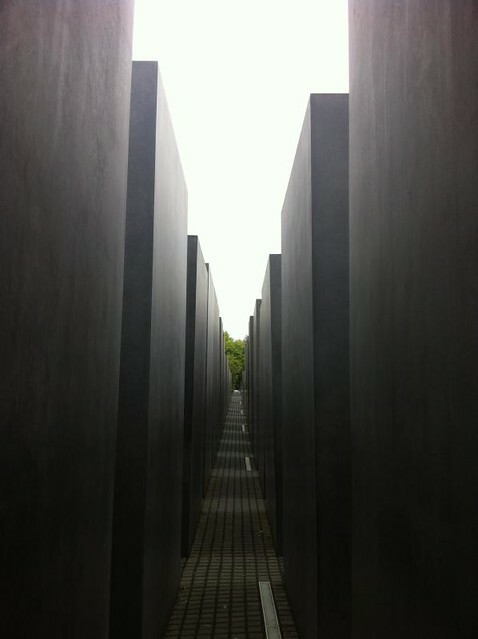 To learn from that is also a meaningful experience. Last but not least (actually it is the most), it is the personal connection – the friendship. I am committed to do whatever I can do to help my YLF friends I know because of the many things I received. 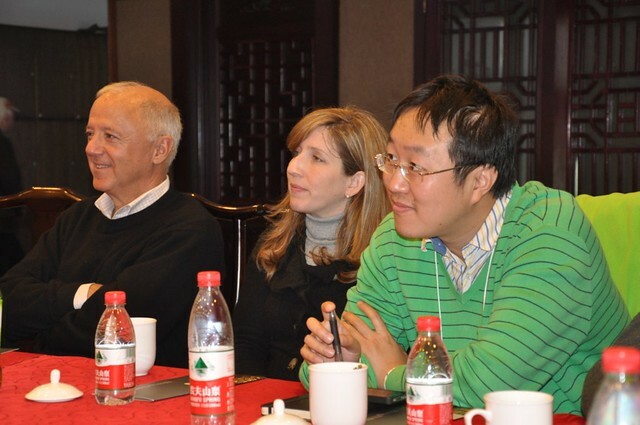 Just like Paul repeatedly gave behind-the-scene tours to YLFers to White House, Mark helped the Chenggang to bring the wedding ring to the space and back (of cause), Kebo were kind enough to sponsor group activities including flight tickets, people have the natural tie, just like a family. This friendship fostered deep engagement after the conference ends. We have people marry each other (Mark and Gaby), investment in each other, work for each other. Just like Steven Jobs mentioned in the Stanford commencement, a forum of 24 people started 10 years ago is just one dot, and the dots got connected in the future. Looking forward, you cannot understand how the dots were connected. It is obvious only when looking backward. At the end, I felt I made a wonderful choice to come here. There is no short term return on events like this, but it has so long time impact to my life. We really need to set apart time to work on some long term things, and we should be generous enough to invest in ourselves to be a more capable, more connected people. There are time in a year that we travels a lot. 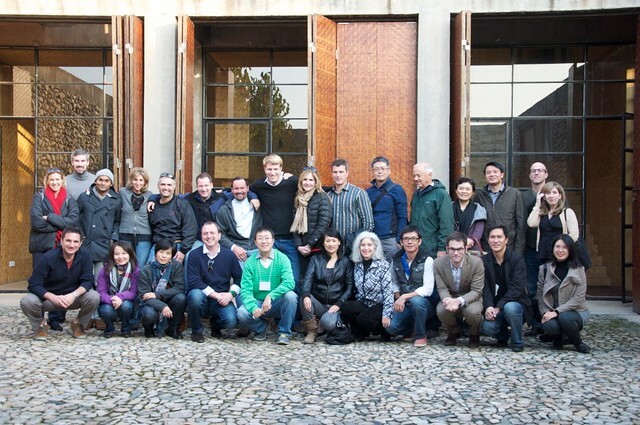 I visited Europe, and then US, and Xi’an. It is too much of travel, and I have a lot of things to do. So, after the YLF trip of today, I officially claim the end of my travel season this year. I will avoid future travel by the end of this years, unless it is absolutely necessary. You will be able to find me in Shanghai. This year’s YLF ended tonight, with a mad karaok until mid-night of both the Chinese and American participants. It was so fun to sing a Chinese song and an American song alternatively. This is the second time YLF went to sing together in my memory. This is my observation of this interesting event. The music is universal. When the music started, no matter it was Chinese or English song, people just started to get excited and swung, and danced with it. That is the mutual bounding between the people. We never feel we share the same humanity as much as when we are dancing with the same music. However, there IS some major difference about the song itself. When the songs like 铁血丹心 of 射雕英雄传 was played, it suddenly became an express time traveling train to take me back to the 1980s when we were in middle school and all the memories of the middle school came out, with some details like the faces of my schoolmates. I believe the American must feel the same when the 1970’s or 1980’s American song were played. 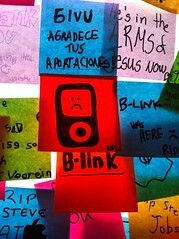 Songs are not just songs for us. They are memories, and they are the real time capsule that preserve the feelings of our early time. Playing a song of 20 years ago is just to open the time capsule and release the old memories. People of similar age will share that feeling. Unfortunately, that feeling is not easily shared by Chinese and American. I have no idea about many songs American picked. Well. There are some common songs, like Michael Jackson’s, however, I don’t know even the same song brings the same cultural feeling for people cross the ocean. I discussed with Sam Wang several years ago about the challenges first generation immigrants face about their children. The key gap between the parents and the native born kids are, the kids grew up with completely different set of songs from the parents. That difference will break the culture binding between the parents and the kids. Typical examples are Chinese first generation immigrants to US, and their kids. There are other examples, as far as I know, are the Indian expats in Shanghai, with their kids. The kids sing all the songs their Chinese classmates are singing, and ops…. a gap between the two generations. We don’t need to have a solution for this. It is not a problem. It is exactly the diversity of world. We should keep it. By having more events like people from different culture to dance and sing together, we are providing a very good exchange among the cultures. P.S. Todd shared about his experience of meditation, and Paul shared the tool of staring at one thing quietly on the bus. That was very helpful. P.S. 2. If you are in Shanghai, you can turn to CBN (Chinese Business Network) 第一财经 on Sunday night at 9:00 PM to watch this episode of BossTown. At the theme of “Solute to Steve Jobs”, I am one of the observers to talk about the topic with Kaifu. The theme of this year’s YLF is YLF Time Capsule – what I am going to put into the time capsule to be opened in the future to help understand the present. I actually will put something that I took out of the time capsule I started about 5 years ago. It is a list of articles I wrote about YLF. You know, I am a blogger. I write daily, in the last 10 years. I have about 70 entries mentioning YLF out of the 3000 entries, which means YLF is at least 5% of my life. The actual impact is even higher than that. I am lucky to be able to read the articles and understand how it got started, and how the magic happened. I know exactly that it was 11:30 am on June 29, 2006, that I met Jan the first time with the introduction of Haisong. It was the Public Intellectual Program of the NCUSCR. I love the program and enjoyed talking with people from the National Committee. I had already heard about great things about YLF and asked Jan if I can be a YLF. She asked “How old are you?”. She may thought I was too young for the Young Leader’s Forum. Then on August 30, 2007, I got the invitation to join the YLF. That year, I wrote a blog about the need of a bridge. Since I was writing a blog in English, I got great amount of questions from my friends in the States about China. I was encouraged by how they are willing to know about China, but also surprised to know how little they know about the country. I realized that we need a bridge, seriously. The logo of the YLF program happens to be a bridge that connect US and China, cross an ocean. What we are doing here in the last 10 years is to build the bridge. We use the unique ways to build the bridge. The first way to build the bridge is personal connections. I am a strong believer of personal connections. It cannot be replaced, even by social media. 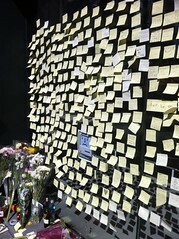 We hear so many news, people, places, and events everyday. I don’t feel strongly for most of them since we don’t care. “Why I should care when a space shuttle launches in Florida?” I started to care so much when the friend I made here, Chris, is on that shuttle. That makes a huge difference so I wake up in late night to watch it. I had no personal connection with architect, until I have great friend Gregg, and I started to pay attention to any architect. That personal connection is so strong, and powerful, and it can help to make the relationship between US and China better. I would say, John Holden’s initial vision about the program is archived to certain extend. The idea about the program is to build personal connection, so in the future, if things like the bombing of Chinese embassy, or plane collapse happens again, someone in US or China can pick up the phone and dial the counterpart to seek for a solution before the situation get escalated. The second way we build the bridge is by sharing different perspectives from both side. The best story to describe the current US-China relationships I know is the story of the blind men and the elephant. The six blind men approached the elephant and everyone just grasped part of the elephant, and cannot agree with each other. The best way to help them is to get everyone sitting together around a table, and share what he saw in an open and honest way. In the forum, there are different opinions, and some times, conflict options. In fact, those conflicts are often the highlights of this program. By acknowledging that we are only blind men who are able to see only small part of this world, and just a small slice of time in history, we share and we understand better. I cannot express how much I appreciate the organizer to arrange the conference in both China and US alternatively, and the great places we visit. 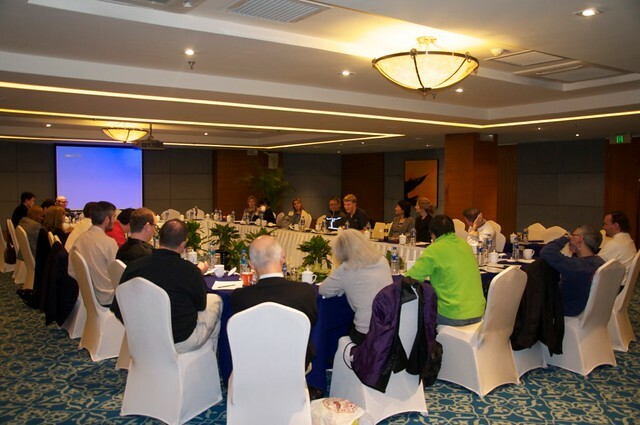 No to mention forums held in US, even for the forums held in China, I got completely new perspectives even for China. When I was desperate about how ugly and fast-pace the current China is, the trip to Suzhou during the Nanjing forum, and the trip to Folk Museum, and Shuiluan during this trip let me find the confidence that how beautiful and graceful ancient Chinese were. The trip to Suzhou Museum and this time, to the Jade Valley enforced the hope that there are people building grace and beauty today. With the accompany of my American friends, I actually see China better with their thought-provoking questions. I want to put the list of articles I wrote about YLF in the last 5 years into a time capsule and open it in 25 years. I hope at that time, the seed we are planting today via Personal Connections, Sharing Different Perspectives, and First Hand Experiences will have great fruit to help build a better US-China relationship. YLF has unique connections. The second day conference were held in unique places. June connected us with Shui Lu An where she helped to preserve, and Haisong and Phil connected us with Jade Valley Winery, where we held the nice discussion in the afternoon and dinner. Jade Valley Winery is one of the most unexpected encounters during the last few years for me. In the middle of the mountains of Qin Range, and beside the villages that cannot be more common in the area stood a Stone House, a residence that is built with the modern architect. 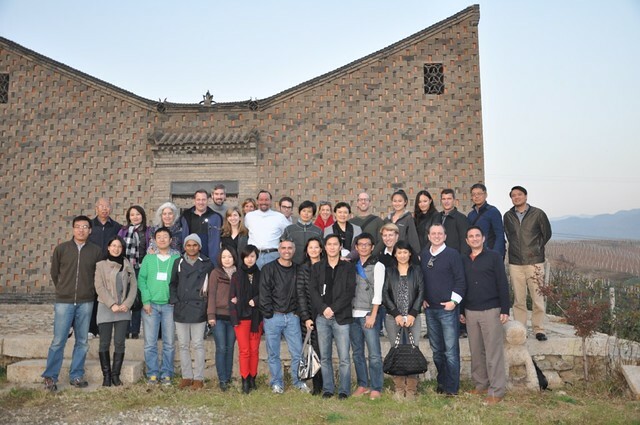 We also visited the Jade Valley Resort – a well designed and constructed site at the top of a hill, facing the G40 Shanghai – Xi’an Expressway, and a large grape land. 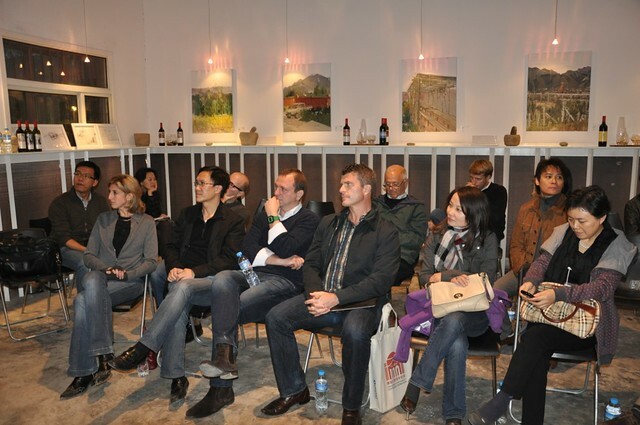 In fact, it was amazing aspiration to start to plant grape in Xi’an – a place traditionally not connected with wine, and some decent architects in the mountains, well, in the middle of no where before its existence. Mr. Sun’s talk about the dream they were pursuing were very moving. He and Professor Ma are not the only people we met with a big dream and do it in a persistent way, even to an extend of behavior art. I understand the idea behind everything they did was to turn a new face for the rural area of China, and allow the humble Chinese farmers to live in a more dignified life. I’d like to do what I can to support the dream. The Jade Valley wine is good (well, at least to me), and it can be ordered in M on the Bund, the new Peninsula hotel on the Bund and other places. The name is Jade Valley. I believe when people in China end the centuries of hunger, and war, we get back to the original track to pursue happiness, grace, beauty, and all kinds of great things, just as our ancestor did in the last few thousands years. 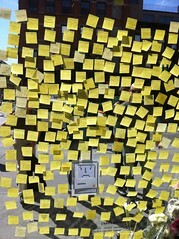 Mr. Ma, Mr. Sun, Ms. Wang and all the team are the hope. P.S. I am very looking forward to the tomorrow’s session (I missed part of the sessions this morning due to a conference call, and I felt terribly bad about it), and I am looking forward to the next decade of the YLF. P.S. 2: Topic of my presentation about YLF Time Capsule tomorrow? I am going to talk how YLF build a bridge between US and China via personal connection, sharing different perspectives, and first hand experiences. I cannot believe it that it is the tenth anniversary of YLF (Young Leader’s Forum). It is the biggest personal commitment I made during the last five years to take three days out of the 365 days I have (about 1%), and it is also the best rewarding time I got. It is so amazing to spend time with the really talented people from both China and US, and from many sectors (business, architect, lawyer, dancer, education, journalism, military, space program, government officials, artist, publishers – you name it). Although I do hope I can be with the company in my daily work so much (exciting things going on there), I always told me that this is the best long term investment in myself, and even in the family, and the company around me. It is basically about making personal connections and make myself a better person. Uncomfortable Dependance. It is to describe the relationship between the current US and China. It is one of the hardest, and the most important relationships in current world, and we are here to contribute a little bit to this world. Strategic Ambiguity – a phrase to describe the current US policy on Taiwan issues. When everyone is looking back and see how big the impact of this highly influential group impacted their lives, I am also thinking about the topic, and about what is the topic of the presentation i am going to talk about this Saturday. I missed the most of the part when Mrs. Zhang described the Xi’an Wall protection, but we finally end up riding the whole circle of 13 km atop of the city wall. It was completely recovered. Isn’t interesting to see the circle of building the wall, tearing it down and re-build it again. Maybe after few decades, people have no idea about how stupid we were at the mid of the last century. The wall is just beautiful. It is the city I took a train alone when I was 13 years old alone, and transit via bus to Tongchuan. That was a wonderful journey. I directly walk from the train station to the bus station. Now, the section of the city wall was rebuilt, and there is no more walking – that is the reason I have a vivid picture of the city without a wall was like. Wow. What a busy day. With two meetings in two places, and many meetings in the office. I even left my laptop in the Peace Hotel (and finally found it), and still have no idea where I left my jacket. When I am at the flight to Xi’an, I was completely tired. I met Haisong, who introduced me to Jan and later to YLF on the plane. We talked a lot, and when we get to the Kempinski in Xi’an, it is already the mid-night. I happily escaped from starving to death by eating a bowl of noodle. When I finally sit down and think about the day – hmmm… It is the first time I travel without watching taking off and landing from the plane window, and the first time I basically didn’t see any scene or observe the architect of the hotel, and the first time not interested in looking out of the window of the hotel. It is the time to sleep. Disclaimer: I am only talking on behalf me, and stating a fact that just works for me. Not anybody else. There is some benefits about not being that public. Weibo or twitter is really good at spreading the message to as many people as possible, but it is too public that you can hardly have time to be quiet and be honest to yourself. Writing a blog, if you are too concerned about the public response, chances are, you are not writing anything that worth recording. We often fell into the trap to believe we are somebody. We try to act everyday to be a “proper” person, but it turned out that no one really cares about you as much as ourselves. Well. One experiment I did for almost years is, to publish my mobile phone number to this popular blog – check the home page and look at right. So far, basically nothing happened. We are way too concerned about privacy, about this and about that. But if we are not honest with ourselves, blog is not a blog. It will be a personal propaganda to the world. In short, blog is an environment that selected people will take the time to follow your writing, not everyone, and that helps us to write more honestly. Hmmm. Do you think twitter or weibo is better for showing off? The time devoted to blog are deep nights for me most of the time. That is the better time to do a little bit reflection on the day, sometimes on the last few days. The time alone is critical for people’s improvement. Ann has the habit of running 7 kms everyday to have that lonely time to face her heart. For me, the time is more like blogging. Twitter? The time are more likely to be in cars, or waiting for coffees. That just does not work for me. When I am back to the pace of writing blog in my way, I am more confident in keep writing. At the end of the day, I am the most important reader of this blog, not anyone else. Whenever I felt frustrated, and felt there were so many balls falling and so little time, my friend just smiled and told me: “Welcome to the world of a CEO”. Yes. That is the experience to be a CEO. As an entrepreneur, you are facing the challenge that only the people who were in that position can understand – the loneliness, and the excitement – oh, boy, nothing in this world is comparable to that. I show my full respect to every CEO in this world – even my competitors, even former Apple CEO, former Yahoo! CEO, and former whatever company CEO who ended their career in a way of public failure – they have all the due respects, not to mention the greatest CEOs of this century – Steve Jobs, Bill Gates, and Jack Welch. We are just the same kind. Few weeks ago, I had breakfast with Sun Cheng-Yaw, and Jack Gao (one was the former HP Greater China GM, and the other was former Microsoft China GM). They shared their experience of running a company as the real CEO and a big country subsidiary. Basically the difference is, you know you can screw up a company single-handedly while screwing up China does not kill HP or Microsoft. Pressure really comes from responsibility. I am just trying to be a better CEO – a journey that needs a lot of work, and needs a lot help. The most important thing is to surround yourself with the right group of people, and share the same dream. That is so important, and I will name it as the third learning in my startup, besides the two I already shared with Stanford students few weeks ago (focus and cost). The Mount She (It is pronounced as Sheer, not as the female pronoun), is the closest mountain to Shanghai (it is at the Qingpu District of the city). It is maybe the only climbable nature thing in this city. Wendy and I decided to go there and climb the mountain. It is not far from our home in Pudong – 51 km. We climbed the mountain – it is lower than most of the buildings in this city – less than 90m. Within 20 minutes, we went to the top and get to the ground, pretty confused, and disappointed by how low the hill actually is. But anyway, it is a very nice place to spend some time. The national park is free of charge. You just need to get to the gate before 4:30 pm. Steve Jobs Funniest Joke. Even Bill Gates Laughs! He said Apple is like a ship with a hole in the bottom, leaking water and my job is to get the ship pointed in the right direction”. (Ship-pointed-to-the-right-direction is quote from the former CEO of Apple, Gil﻿ Amelio, who badly screwed the company). Storm at Real Estate Market? 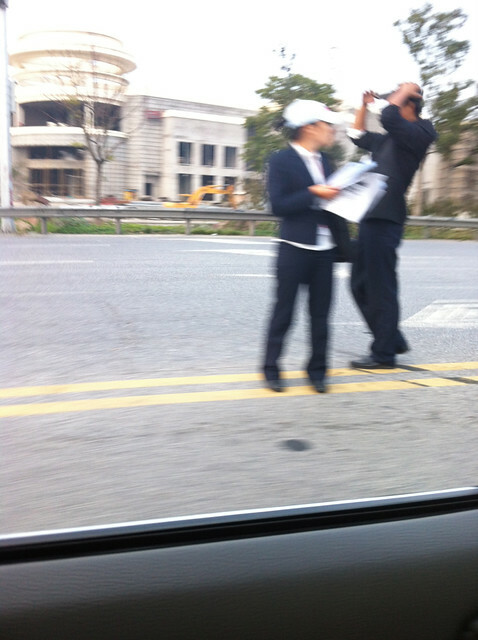 At Sheshan, I saw about 20 real estate agents running everywhere to stop cars passing by, trying to sell low price villa to the passengers. The red price line was surprising – it said 50% off! I have no idea about whether it is the actual cut, but it just give me the dramatic feeling of a burst of bubble in the real estate market – very dramatic feeling. Let’s just wait and see what is going on. A new week is ahead, and I am really excited to start the week tomorrow. There is a big blueprint out there, and I just want to get it started, and finish it ASAP. Tomorrow is my birthday. I am happy to turn 34 (or some people say, to be 35). I just felt that I have passed the age to make birthday resolution now. It has been great year for me – experienced many ups and downs, and grew a lot. I just feel I am surrounded with great friends and mentors each year. P.S. I realized that I posted a “Happy Birthday to Me” every year since I started in this blog – from 2002, to 2010. It is almost a behavior art to write the same thing every year – for 9 years in a row. 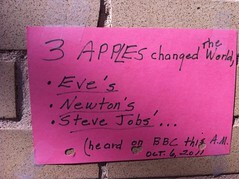 California claimed Oct 16 is Steve Jobs day. It is a well deserved honor. I don’t think Steve ever cares about it when he was alive, and when he knows his days were limited. It reminded us the saying that “What matters is not what the world give us. It is what we offer to this world”. 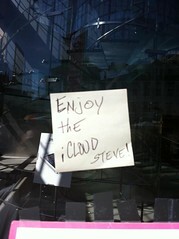 Steve offered a lot, and he is remembered. Sometimes, people need such inspirational moment when a great person leaves us as wake up call. It serves as a north star to help us understand what matters, via the life of another great person. 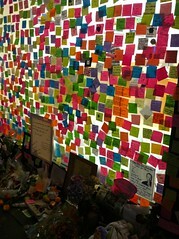 That last time I was shocked, and moved, and in deep thoughts were almost 6 years ago (the flower I left in that space). Steve’s life (especially the later part) was guided by a personal vision – something to define what he is about and thus defined what a company was about. We need that vision to help us understand what we are about. With a night of download and a hour of installation, my iPhone 4 now runs iOS 5, the newest mobile operating system. The most exciting feature of iOS 5 is iCloud, and I am testing it right now. So far, the iCloud Experience was good – the photo stream feature basically delivered what it promised, but it is not as fast as I expected it to be. The photo will appear on my computer about two minutes after it is taken – not immediately. Should Apple strive to make it happen? That will be more intuitive (a typical demanding user). To make the Volume up button a photo-taking button is not rocket-science, but it worked. Interesting design. Besides these obvious changes, the excitement of a new OS quickly fade out. iOS 5 didn’t add any significant feature other than the small improvement, and my night’s effort quickly looks not as exciting as it seemed to be. That is how interesting people’s expectation almost always higher than the actual – expectation for any new gadget or house, or whatever. 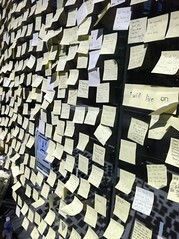 These are the picture of the memorial of Steve Jobs at the Apple Store at 14th Street in New York. 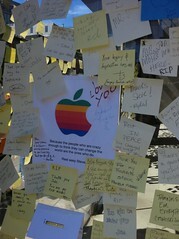 The memorial at the Apple Store on University Ave of Palo Alto. 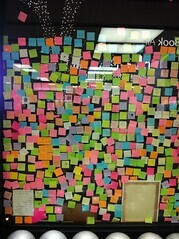 It is more colorful, but the sorrow was as deep. I am watching many video – interviews, and product launch of this incredible person and started to read many books about him. I am also anxiously downloading the iTunes 10.5, so I can download and install iOS 5 on my iPhone. It is so interesting that I didn’t sleep over night and cannot wait to upgrade my iPhone 4 to iOS 5, exactly like Yifan won’t go to sleep when I bought him a new set of Lego – he just cannot go to bed and close his eyes when he knows the existence of a box of Lego! This is how Steve turned us into children. Steve is a great leader with amazing vision, and execution to make it happen. It is just a miracle. When I am talking about the feeling of New York, something reminded me of the feeling. 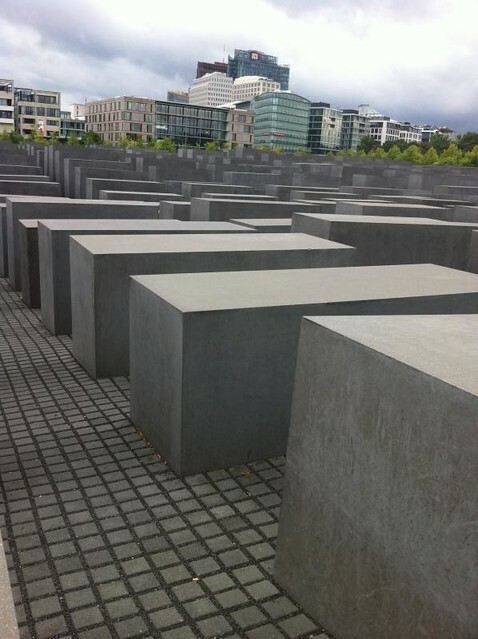 That is a memorial in Berlin – the Memorial to the Murdered Jews of Europe. 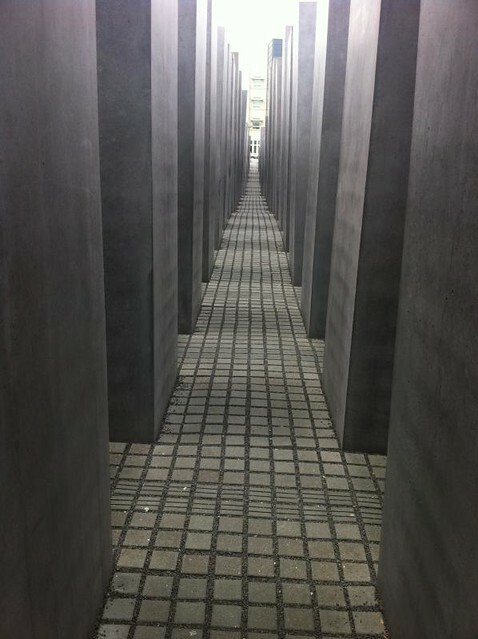 I don’t want to connect New York with murder, or holocaust, but from the architect perspective, you can see something in common. 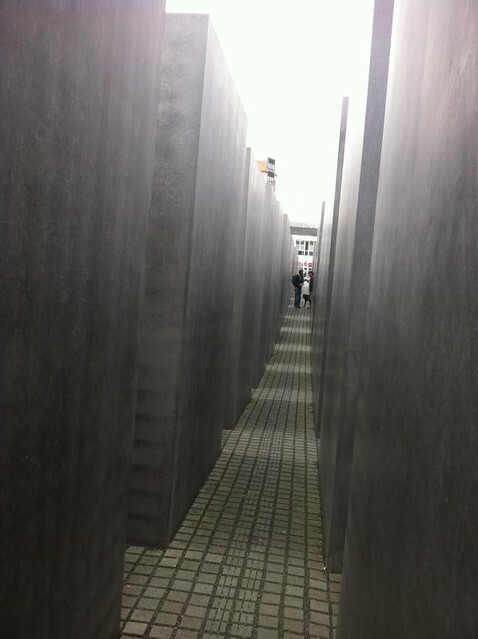 When people get in to a maze of poles, and look left, it is an alley, and to the right, it is the same. People just want to escape. Look at this. Is it the same as standing at 31th street, and 6th ave? Wendy and I am at JFK airport, wrapping up the four day trip in NYC, the big apple. When we said bye to our friend Sam, where we stayed with during this trip, the two small worms of this big apple is leaving. Yes. I did feel the reason why people call the city big apple – in the city, there are basically hard to see the sky (especially in mid-town), and we are just here wandering from street to street, and drink, and eat in the shops, and rest in a small apartment in the big city – just like worms. The city is so sweet, delicious, and attractive, to the small worms in it. Now, the two worms are leaving the Big Apple. When I am wrapping up with my New York trip, I have mixed feeling. On one hand, New York is not the city for me. One the other hand, it is so energetic, so colorful, and has so many to offer, that I miss it immediately when I am ready to leave. Thanks Sam for hosting us, Seamon for hosting us and arranged the two great dinner so I can meet many new friends in New York (from the financial world). Thanks Jon for organizing the other dinner, and people who came to my blog meetup. New York is a financial center. 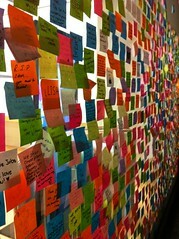 It is a paradise for finance industry, artist,, fashion designers, and many other people, but may not be the best place for Internet startups (so far, I only know foursquare.com, gilt.com, theladder.com). Most of the people I met so far are in financial industry – hedge funds, trading desk, PE, leverage financing… The terms I don’t understand. 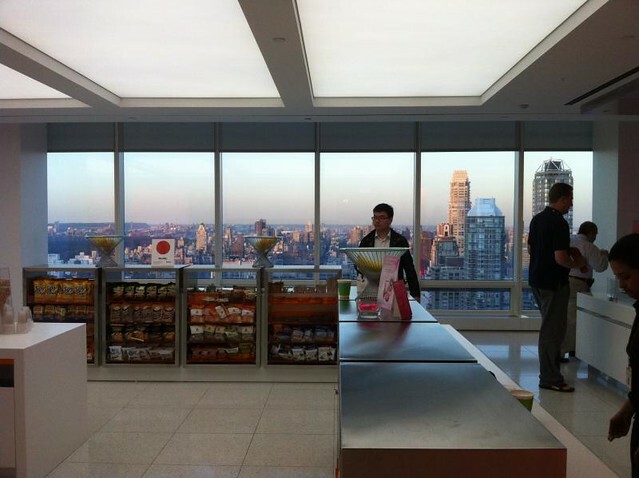 Time is New York is not be happiest time in my life so far, although the view is amazing. From personality type, I just feel I belongs to the places like bay area better, than NYC. It takes courage, to be the leader of something big. Jobs taught us so. Another exciting day in New York. Although I didn’t pack my schedule as busy as I did when I was in Silicon Valley (most of the business meetings were completed yesterday), there are still a lot interesting things to do in New York, especially when I have unbelievably kind friends here who took great care of me. 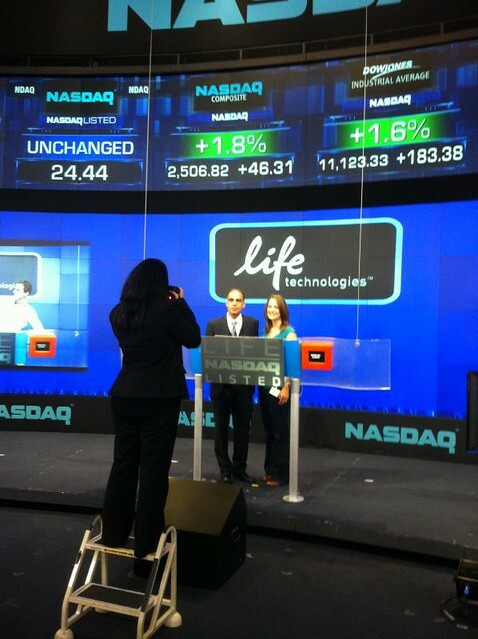 The day started with a visit to the NASDAQ Open Bell ceremony at 9:30 am. 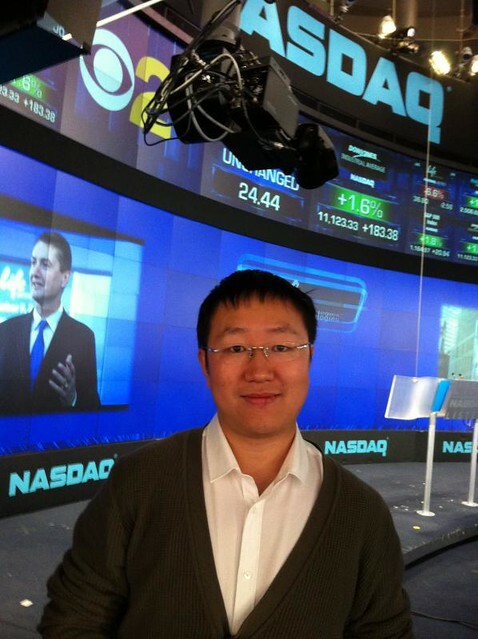 I was actually quite impressed by the way NASDAQ worked. 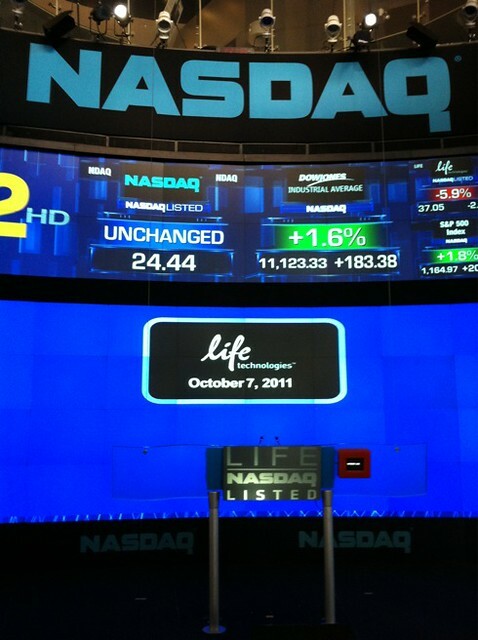 At the Times Square, if you locate the NASDAQ Tower (very easy to see), and there is a glass room at the street level. That broadcast room IS the place to ring the bell. I thought it would be a place inside the building with a lot of people trading (the typical scene found in the NYSE, and Shanghai Stock Exchange), but they don’ t have that. 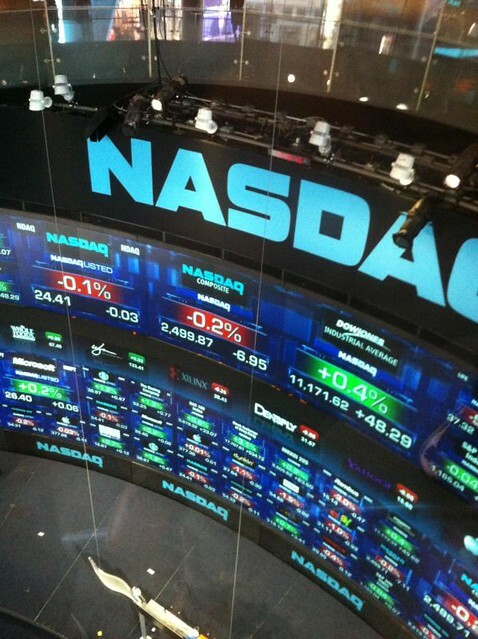 As a completely automated system, the National Association of Securities Dealers Automatic Quotation (NASDAQ) does not have a physically marketplace (just like Baixing.com). The tower (called Marketsite) is just a terminal of the real system – just as millions of terminals saw by millions of people worldwide. It is actually a broadcast room. Sherry told us that more than 100 TV programs were broadcast exactly from that room. The audience of the opening ceremony in the room is not too many, since there is no room m for more than 30 people. 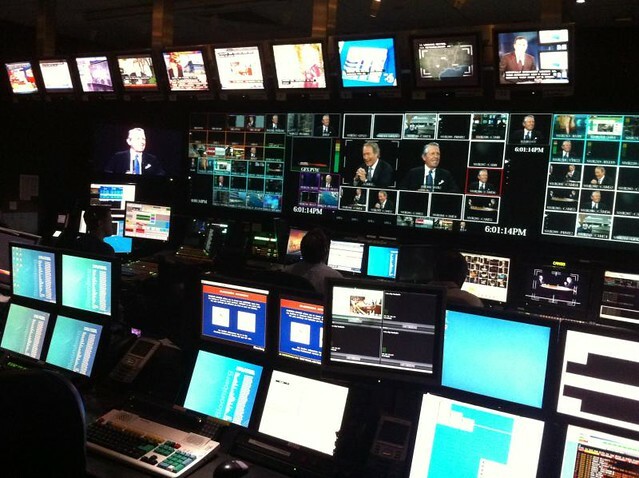 However, what is happening in the room is broadcast on the screen of the big tower in real time, and the ticker will be promoted all day round, making it possible to be seen by 1.6 million people in Time Square that day, not to mentioned the people seeing it from television. People can get onto the stage, and the professional photographer can take a photo, which will be shown on the tower in a moment. 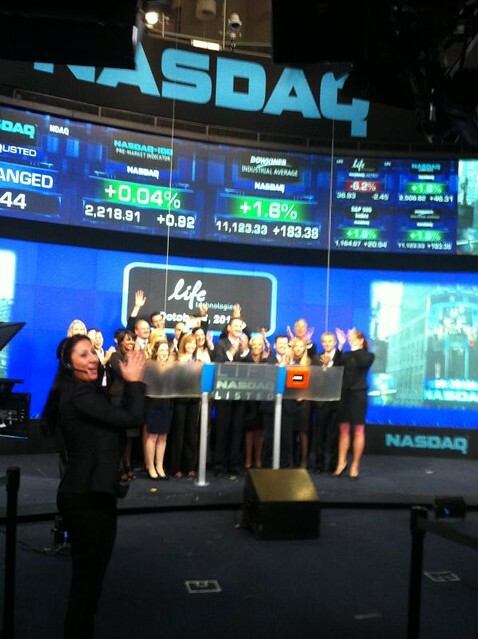 Look at the team who rang the bell. With the strong disco-volume music, and a press of button, the NASDAQ market started to run (well, of cause the actually system is not really controlled by the button). The big screens turned and displayed the real time stock price. The first few seconds was the most exciting one since everything changes so dramatically when the market opens, and it will get stable few minutes later. It was a very memorable experience. Thanks to Sherry and Brian for inviting us. 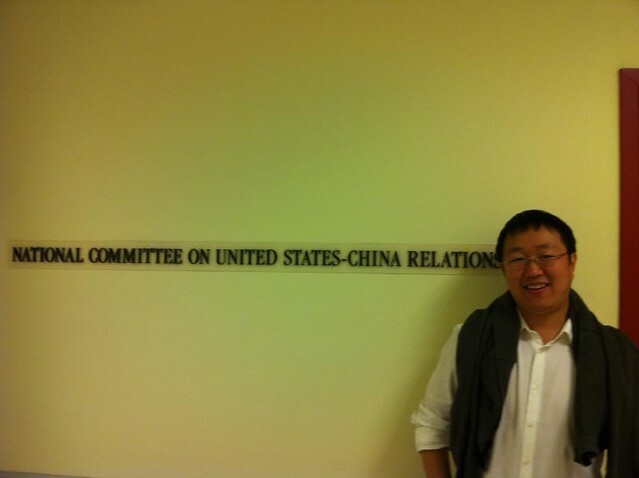 The next stop is National Committee on United States-China Relationships (NCUSCR) at 23rd/6th. Just as NASDAQ, which saw the dramatic changes in the financial world, NCUSCR saw the change in international relationship world. I treated here as my home in New York City, since I am a proud member of Young Leader’s Forum since 2007. Jon brought me to the High Line area in Chelsea. 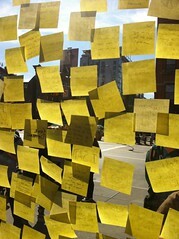 We enjoyed the special perspective offered by the High Line project. We talked about the history of Friends of High Line organization. It was co-founded by Robert Hammond (YLF 2006 Fellow), supported by Vishaan Chakrabarti (YLF 2005 Fellow), and architect design by Gregg Pasquarelli (YLF 2002 Fellow), I just felt a strong tie with the amazing project. 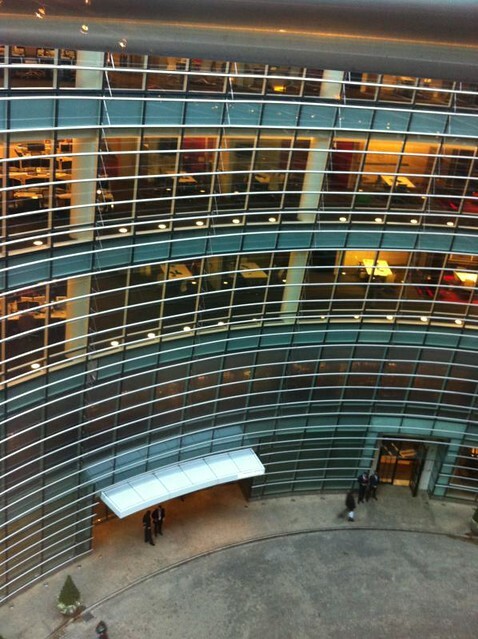 I ended the day with a visit to Bloomberg headquarters, the center of finance media world. I was invited by Charlotte Morgan (YLF 2009 Fellow), who is producer of the popular talk show Charlie Rose, and I had the opportunity to look into the producing room, and the actually taping of the issue with Gary Player (top golf player after Tiger Woods). I made another quick drawing of what I saw on top of New York. I’d like to thank my friends in NYC to offer the great insider tour for me to experience a New York not every tourist can see. The day is so excited and full that Wendy and I wrapped up the day with set meal in McDonald’s to balance it. P.S. Last but not least, Happy Birthday to Wendy! I love you. It will last for one hour until 6:30 pm. This blog has been running for 9 years, and we have meetup from time to time. 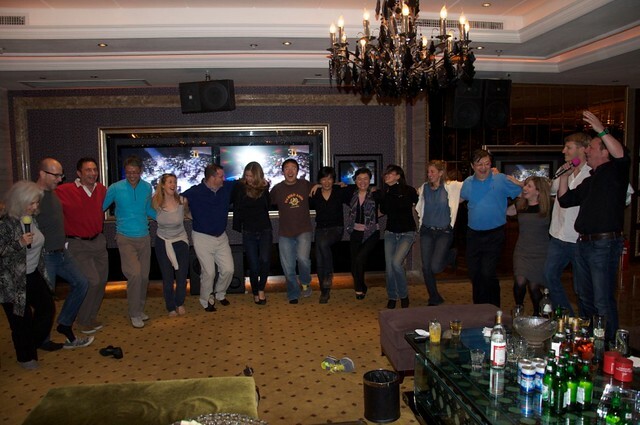 The first was in 2003 in Shanghai, and few times later (like this one in 2008). It also happened in other places in the world, like San Francisco, and Palo Alto. This is the first time it comes to New York. But as always, as a person who is incapable of planning anything in advance, it is always in the last-minute announcement style. If you are planning to come, please quickly post a comment either via Facebook, or using the old comment function (I am still thinking about how to integrate them together). It is OK if you show up without comment – it is in extremely informal way. Q: What is the topic? A: How to leverage it to help people more. A: I don’t know. Previous meetup varies from one person to more than 20. I am using the small screen iPhone to write this blog. Sorry for being brief. 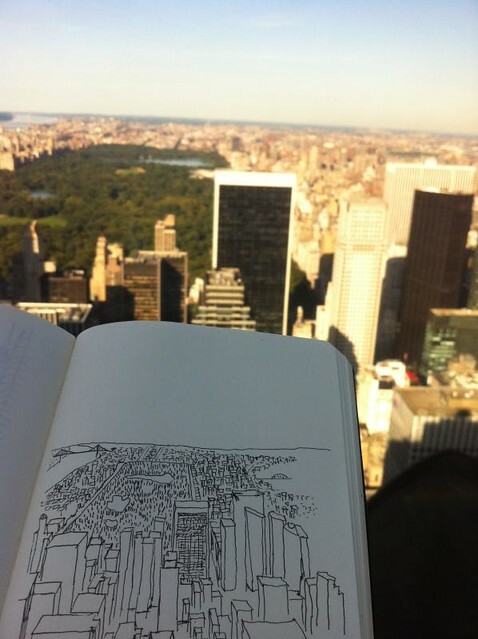 New York stimulate my desire to make more drawings. I did and I will share when I can upload a picture. Check my Flickr account to see it now. The New York did lost a lot when the twin towers of WTC are gone. 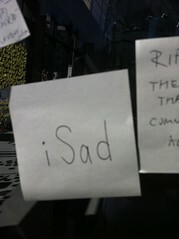 I share the pain of New Yorkers. Buildings are missed, not to mention the humans. Had wonderful dinner with friends in the financial industry. For the first time understood that there are so many people so close to Wall Street cannot trade public stock because of SEC regulations. They knew too much to trade, for themselves. The Statue of Liberty cruise is a big trap. We stuck there for two hours before our meetings. Just took forever to get off and on the ferry. Why I had the stupid idea to go to where tourists go? 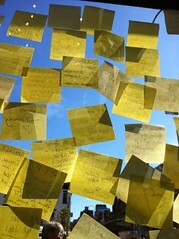 I am thinking about a Wabgjianshuo’s blog meetup this Saturdsay. Stay tune on this blog. Used the iPhone application Uber to call a taxi today. Very good experience. Just tab on the screen and a taxi comes within 10 minutes. Pretty handy at rush hours. New York is much more concentrated than Shanghai (forget about Beijing) and that is a big advantage. People are basically within walking or short subway ride from each other. I am surprised how many people actually live in Manhattan.